Many travelers fantasize about being able to leap centuries, imagining themselves in a future utopia or experiencing a medieval joust. 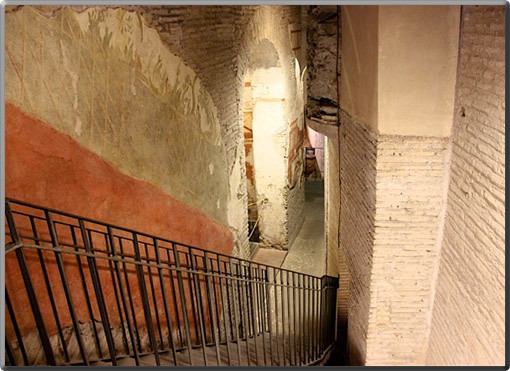 So when my husband, David, was speaking at a climate change conference in Rome, Italy, I chose to time travel in a real place in real time by touring some of Rome’s underground sites. More than once, I wondered if I would have walked Rome’s streets as an affluent housewife or as a slave! 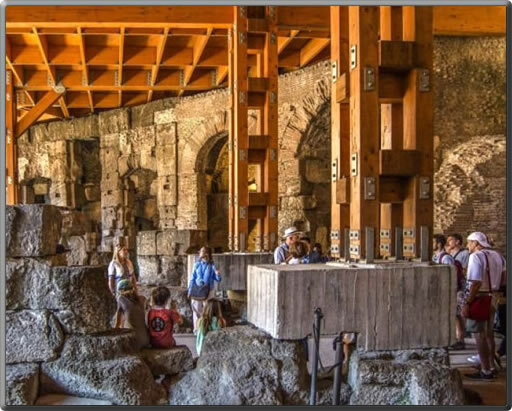 Without knowledgeable guides, I wouldn’t have appreciated the rich history and evolution of the three churches/crypts I visited on my first tour, nor the Palatine Hill and Colosseum on the second. 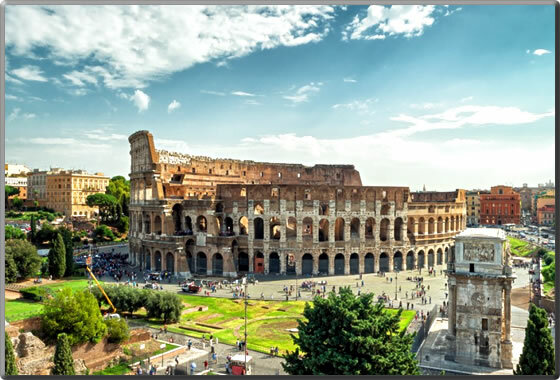 Booking with small-group operator, Through Eternity Tours, I met two guides, Gracelynn Monaco and Enrica Armementa, both well schooled in Rome’s heritage. 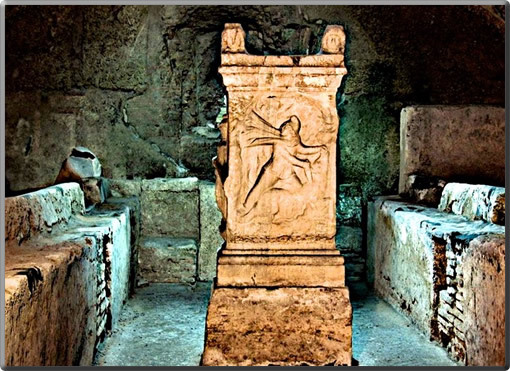 In the 1850s, Irish Dominican priest/archaeologist Joseph Mullooly began excavating the 4th century Christian basilica beneath San Clemente, installing staircases and reinforcements. Sniffing the earthy scents as we descended the staircase, we found remnants of the fourth-century Christian church with large blocks of tufa (a form of limestone) supporting the weight of the basilica above. Nineteenth-century fading copies of original frescoes depicting Christian scenes festoon the walls. Bits of sculptures and relics are imbedded in the buttressing walls’ plaster. We emerged from the dark caverns to walk a quarter hour in glorious October sunshine to the church of Basilica of Santi Giovanni e Paolo (Saint John and Paul), who are thought to be Christian martyrs. The edifice has had many iterations and has no pastoral function today, but is a popular wedding venue. Descending to the crypt excavated between 1857 and 1958, we found many colorful, well preserved frescoes, intricate brickwork, living quarters, parts of apartment buildings and a wealthy family’s mansion. 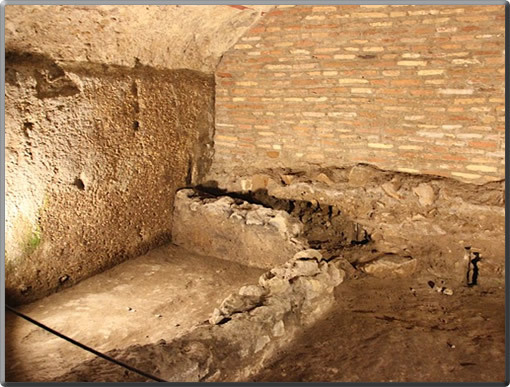 I was pleased to see how Romans had increased comfort by including a bathhouse, fountain and latrines. Like many places today, the mansion had replaced former, lower-status apartment buildings when the area was gentrified. 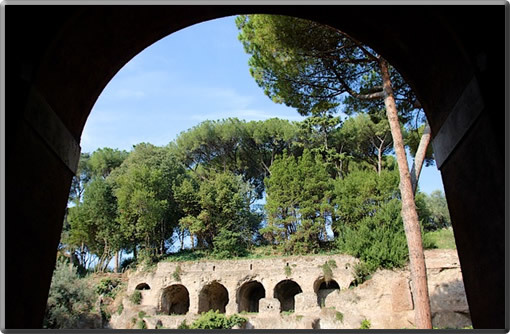 To reach San Nicola in Carcere (St. Nicholas in Prison), we strolled past the Circus Maximus, an immense area where the horse races of republican Rome were held (reminding me of Ben Hur), and reached our third subterranean site. Again, it’s a church of many layers, with six columns from the 200 BC temple of Juno embedded in its 10th-century church’s outside wall. Three temples (honoring Juno, Janus and Spes) and remnants of an Etruscan vegetable market and slave market rest under the church. The temples once served as a jail. According to Roman mythology, the Palatine Hill, part of my second-day tour, contained the cave where twins Romulus and Remus were found by the she-wolf Lupa, who suckled them. Later, in a power struggle, Romulus killed Remus, became king and named the city after himself. Enrica led us on a brisk walk up the most central of Rome’s seven hills, rising 40 meters/131 feet above the Roman Forum—once the site of market places and a location for celebrating military victories. From on high, I relished the terrific views we had of these mythic places, now containing a hodgepodge of preserved and ruined buildings, pillars, arches, walls, niches, bits of mosaics, courtyards and the remains of palaces. 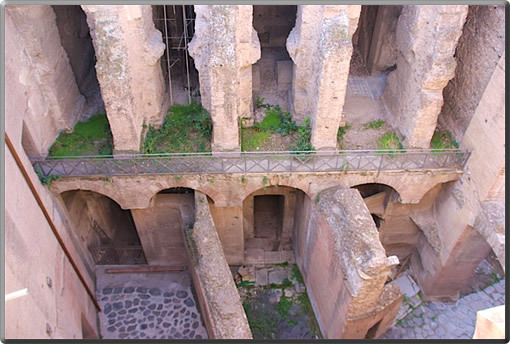 Some excavations show former underground chambers; other wall openings reveal dwellings and meeting places. What especially caught my eye are the many levels of “the big layer cake” revealed by the hill’s sides. My visit to the underground portions of the Colosseum— the largest amphitheater ever built—completed our tour. This six-acre site has a similar evolving past as the other buildings I’d visited. 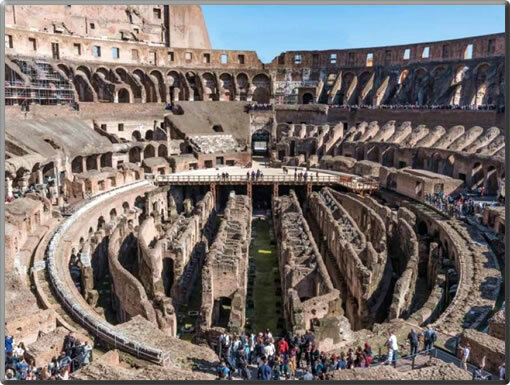 Emperor Vespasian started it in AD 72; the theater could hold up to 80,000 fans who came to watch gladiator fights, animal hunts, mock sea battles and executions. After the sack of Rome by invading Visigoths in August 410AD, this city’s vast structure was used for housing, workshops and a monastery. This was the first time in almost 800 years that Rome had fallen to a foreign enemy. 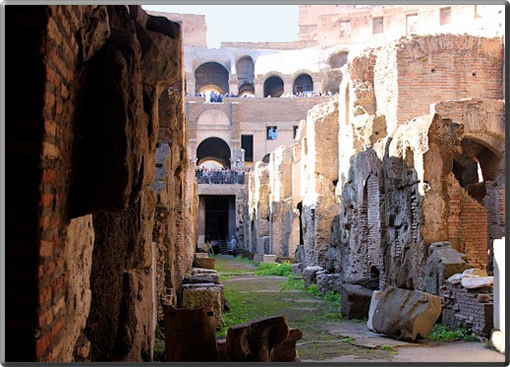 We walked among many corridors that divide the Colosseum’s central oval. The chambers that once housed lions and gladiators gave me twinges of distress. A replica of a cage showed how a system of ropes and pulleys could lift lions through trapdoors to the spectacle floor. This history is real, but the fact that men, trained to fight to the death or defending themselves against hungry predators, is horrifying. Yet these bloodsports—and the bets placed on their outcomes—were part of the popular entertainment that kept the populace from revolution. My two tours were a terrific introduction to a small part of this multi-layered city. Although these sites can be visited on one’s own, having a well-informed guide makes the history and evolution of these churches and heritage venues vastly richer. Follow Up FactsMany underground tours are available in Rome; to see all the sites could take months. I chose Through Eternity Tours (www.througheternity.com/) because they lead small groups and my time was limited. Registration provides detailed instructions on public transport. Registration on line is the easiest way to secure a spot. The first day lasted four hours, including the walks between the three venues; the second Underground Rome Tour, lasted about 6.5 hours, with a short break for lunch. To participate, you must be able to walk for those number of hours and capable of climbing hills and stairs. 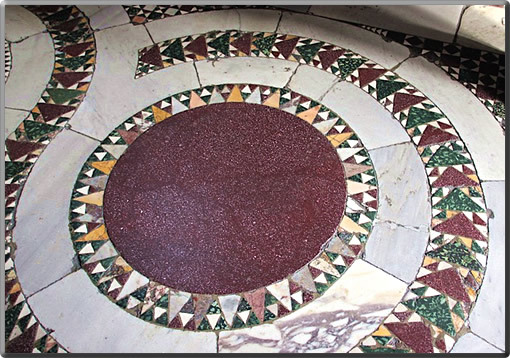 Floors underground are often uneven and lighting is sparse. I brought a small flashlight, snack and water. Sturdy walking shoes are a must. Based in Victoria, British Columbia, Marianne Scott writes for numerous publications in the U.S., Canada and the UK. She also writes as a volunteer for some non-profit organizations. Marianne is the author of Naturally Salty — Coastal Characters of the Pacific Northwest, and Ocean Alexander, the First 25 Years. Her website is www.saltytales.com.